Survivors in Butte, Los Angeles and Ventura counties with disaster-related losses can apply for disaster assistance online at www.disasterassistance.gov or by calling 800- 621-3362 (TTY 800-462-7585) anytime from 7 a.m. to 10 p.m. local time (PST) seven days a week until further notice. Multilingual operators are available. Disaster assistance is not a substitute for an insurance payout. It can help you make essential repairs to your home to make it safe, sanitary, functional and accessible. FEMA disaster assistance cannot make you whole but may help you begin the recovery process. Remember: FEMA grants do not have to be repaid. FEMA assistance is nontaxable and will not affect eligibility for Social Security, Medicaid or other federal benefits. Contact FEMA again if you have any updates or changes to your application for disaster assistance, including access to your primary home, utility service, and current location. Visit disasterassistance.gov or call 800-621-3362 to update your application. PLEASE NOTE: Registration for federal assistance was Friday, Feb. 15, 2019. Small Business Administration (SBA) disaster loans are the primary source of money to pay for repair or replacement costs not fully covered by insurance or other compensation. The SBA offers low-interest disaster loans to businesses of all sizes, most private nonprofit organizations, homeowners and renters. Businesses may borrow up to $2 million for any combination of property damage or economic injury. While homeowners may borrow up to $200,000 to repair or replace their primary residence, and homeowners and renters may borrow up to $40,000 to replace personal property. SBA offers low-interest working capital loans, Economic Injury Disaster Loans, to small businesses, small businesses engaged in aquaculture and most private, nonprofit organizations of all sizes having difficulty meeting obligations as a result of the disaster. Apply online using SBA’s secure website at disasterloan.sba.gov/ela or in person at any Disaster Recovery Center. For additional information about the SBA, call 800-659-2955. Individuals who are deaf or hard-of-hearing may call 800-877-8339. SBA has opened a Disaster Loan Outreach Center (DLOC) in Chico to meet with business owners and residents to answer their questions, explain SBA’s disaster loan program, and close their approved disaster loans. *SBA relocated its Chico outreach center from the former Sears building to the St. John’s Episcopal Church Tuesday, March 12. FEMA and non-profit recovery organizations are working diligently to assist individuals and families impacted by the recent wildfires have a safe place to stay while they wait to return to evacuated areas or begin their recovery if their home was burned. Housing solutions may be grouped into emergency, intermediate and long-term options, and will vary by community and household. Available for survivors in Butte County. For those who are eligible, FEMA will authorize and fund, through direct payments to the participating locations. The applicant is responsible for all other costs associated with lodging and amenities, including, but not limited to incidental room charges or amenities, such as telephone, room service, food, etc. Participating locations are listed at femaevachotels.com. Survivors authorized to use TSA should contact establishments to check on room availability. Available for survivors in Butte County in the fixed amount of $500 in accelerated disaster assistance. Uninsured lodging expenses may be eligible for reimbursement under the Individuals and Households Program. Displaced survivors who were already staying in hotels are encouraged to register with FEMA and submit their lodging receipts. Receipts may be uploaded at disasterassistance.gov. Survivors who registered and did not submit receipts may contact FEMA for guidance in submitting documentation. Homeowners and renters should apply to the SBA, even if they are not sure they will need or want a loan. If applicants are referred, failure to complete and return a loan application may stall their federal disaster assistance application. If not approved for an SBA loan, individuals and households may be referred back to FEMA for possible additional grants. The placement of manufactured homes and recreational vehicles on private property where codes, conditions and support infrastructure are available. Intermediate housing assistance is available for eligible applicants through insurance, FEMA disaster assistance and state supplemental assistance. Intermediate housing that suits the needs of individual applicants is determined through one-on-one interviews with homeowners and renters whose damage or losses meet certain criteria. FEMA is contacting applicants directly to discuss available options under the direct housing program. These options, including rental assistance, are available for up to 18 months, based on continuing survivor needs and eligibility criteria. Housing considerations will incorporate the unique needs of the population affected by the Camp Fire, which includes many seniors and people with access and functional needs. Right now, we are focused on identifying the best solutions for the community. These include the use of recreational vehicles and manufactured housing units. FEMA is working with owners and managers of locations that have existing sites available to place Recreational Vehicles or Manufactured Housing Units, and assessing and determining the feasibility of developing additional sites. Ensuring housing is not placed in high risk flood zones and debris flows areas. To be considered for assistance, at least one person in the household must be a U.S. citizen or by legal definition a qualified alien or non-citizen national with a Social Security number. This may include a child. FEMA is actively contacting survivors to determine their housing needs so that they can be quickly transitioned into an appropriate intermediate housing solution as they become available. Please visit wildfirerecovery.org to find a comprehensive list of disaster programs, resources and information. Federal, state and local partners have collaborated to provide direct housing solutions to individuals and families most severely impacted by the 2018 California wildfires. The following questions and answers address common questions regarding MHUs and FEMA group sites. Q: Who is eligible to reside in a FEMA temporary group site community? Q: How long does a temporary group site community exist? 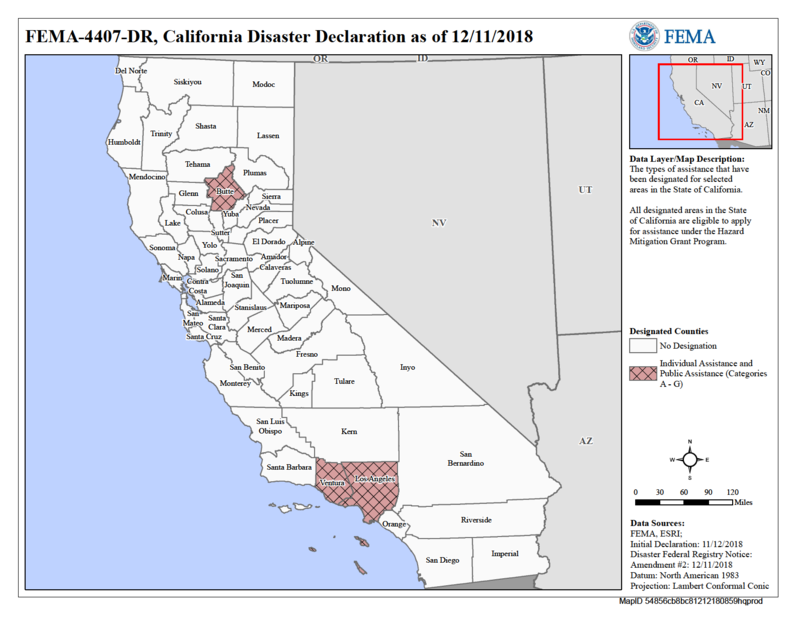 A: FEMA housing assistance for the temporary group site may be provided for a period of up to 18 months beginning on November 12, 2018, the date of the President's Major Disaster declaration, and ending on May12, 2020 for FEMA-4407-DR-CA. Q: Will the MHUs and infrastructure be removed from a group site by FEMA? A: Yes. The MHU will be removed. FEMA will leave behind any installed infrastructure that is installed during the site buildout. A: Yes, FEMA works with city, state and other federal agencies to identify appropriate sites for MHUs to be placed to meet the needs of survivors. FEMA also works with the individual survivor to place that individual/family according to their identified needs. FEMA expects applicants to accept the first offer of available alternate housing that meets their household’s needs. Q: Who can stay with me in my MHU? A: Only those individuals named on your FEMA Manufactured Housing Unit Revocable License and Receipt for Government Property (Revocable License) Agreement can stay in your MHU with you. With FEMA’s approval, you may be able to add or remove occupants from your Revocable License Agreement within seven days of signing. Q: Do I have any other responsibilities regarding my MHU? A: FEMA re-evaluates an applicant’s eligibility on a periodic basis, usually monthly, and the Direct Temporary Housing Assistance eligibility for the entire period of assistance is subject to the occupant continuing to meet recertification requirements. Q: How are FEMA applicants screened to ensure an individual is a disaster survivor? Q: How will FEMA address applicants who commit criminal activities (e.g., drugs, trespassing, alcohol, noise or nuisance activities)? Q: How are FEMA applicants screened to ensure they are not criminals or individuals with criminal backgrounds? Q: Are any items or substances prohibited in and around my MHU? Q: Does FEMA revoke an individual’s Revocable License Agreement when that individual stays beyond their approved license date? Q: Can I keep my pets in my MHU? As well, clause “Q” of the Direct Temporary Licensing Agreement addresses vicious animals. Q: How many parking spots are allocated to each MHU? Q: What happens if I lose power to my MHU? Q: Will I get a washer and dryer? Q: I want cable and internet in my MHU. How should I get them installed? Q: Can my cable provider install a satellite dish or receiver on my MHU? Q: Does my MHU come with a security system? Q: What happens if there is an issue with the MHU or an appliance in the MHU? Q: Can I paint my MHU or hang picture frames? Q: Can I landscape around my MHU? Q: What resources are available to survivors when it comes to food assistance? If you have been affected by the wildfires and are in need of food assistance, apply for benefits through the CalFresh program. Find out how to apply in your county by calling (877) 847-3663 (FOOD) or apply online at: Benefitscal.org. For more information on CalFresh, visit: http://www.cdss.ca.gov/. Uninsured survivors of the Camp and Woolsey Fires living in Butte, Los Angeles or Ventura County, are eligible for free prescription refills, vaccines and medical supplies. Funded by the Federal Emergency Management Agency, an Emergency Prescription Assistance Program (EPAP), has been launched by the U.S. Department of Health and Human Services (HHS). A contractor administers this program on behalf of HHS and will immediately begin taking claims for prescription drugs, vaccines, specific medical supplies and limited durable medical equipment like wheelchairs and oxygen concentrators. The program pays for a 30-day supply of prescription medications for people without health insurance who are affected by disasters. Most pharmacies Butte, Los Angeles and Ventura counties participate in EPAP. You must provide proof of a new or existing prescription. If you need replacement durable medical equipment, medical supplies, or vaccinations that do not usually require a prescription, ask your healthcare provider to contact the pharmacy. All prescriptions processed through EPAP are free of charge. To find a participating pharmacy online, visit https://go.usa.gov/xPUGC. Call the pharmacy listed for your ZIP code to confirm it is open. The Disaster Distress Helpline, 800-985-5990, is a 24/7, 365-day-a–year, national hotline dedicated to providing immediate crisis counseling for people who are experiencing emotional distress related to any natural or human-caused disaster. This toll-free, multilingual, and confidential crisis support service is available to all residents in the United States and its territories. Stress, anxiety, and other depression-like symptoms are common reactions after a disaster. Call 800-985-5990 or text TalkWithUs to 66746 to connect with a trained crisis counselor. FEMA, through an agreement with the Young Lawyers Division of the American Bar Association, provides limited, free legal help for survivors. Disaster Legal Services provide assistance to low-income individuals who are unable to secure adequate legal services to meet their disaster-related needs. Visit here for more information. The Northern California Veterans Administration (VA NorCal) is offering job-placement assistance – and you don’t have to be a veteran to get it. VA NorCal has partnered with the California Military Department’s Work for Warriors employment program to offer job-placement assistance to veterans displaced by the Camp Fire in Butte County, The program has extended its services to any California resident impacted by the Camp, Hill and Woolsey Fire disasters. Veterans and disaster survivors seeking job-placement assistance should call Work for Warriors representatives at 916-854-4426 or e-mail apply@workforwarriors.org. Disaster Unemployment Assistance (DUA) provides temporary unemployment benefits to people whose jobs or work hour losses are a direct result of the disaster. Affected individuals are encouraged to apply for DUA through the California Employment Development Department, which will first check to see if applicants can qualify for regular state unemployment benefits. Do not return home until local officials indicate it is safe to do so. Use an N95 mask to keep harmful particles out of the air you breathe. If you are not ordered to evacuate, but smoky conditions exist, stay inside in a safe location or go to a community building where smoke levels are lower. Anyone with knowledge of fraud, waste, or abuse may call the FEMA Disaster Fraud Hotline at (866) 720-5721 or report it to the Federal Trade Commission at ftccomplaintassistant.gov. You may also send an email to DHSOIGHotline@dhs.gov. Cash is best. If you would like to donate to help fire-affected communities and individuals, cash donations are best. They reduce the amount of labor and the expense of sorting, packing, transporting and distributing donated goods. Relief agencies use cash to meet survivors’ specific needs more quickly, while also supporting local economic recovery. The North Valley Community Foundation is sponsoring several donation campaigns supporting Camp Fire survivors. To learn more or donate, visit https://www.nvcf.org. A growing list of agencies are now accepting monetary donations at http://www.buttecountyrecovers.org. Butte County animal shelters are also requesting no more donations at this time. However, they are facing a long-term sheltering situation and may have needs in the future. Interested donors can visit the North Valley Animal Disaster Group at https://www.nvadg.org/. Looking for Missing Loved Ones? Register as an evacuee and search for registered evacuees at safeandwell.org. Or call the Butte County Sheriff’s Office Missing Persons Call Center (8 a.m.-8 p.m.) at 530-538-6570, 530-538-7544 or 530-538-7671. Contact the North Valley Animal Disaster Group at 530-895-0000 to report lost pets. Large pets can be found at the Butte County Fairgrounds: 199 E Hazel St., Gridley, CA 95948. Small pets are at the Chico Municipal Airport: 150 Airpark Blvd, Chico, CA 95973. If you lived in Paradise, Magalia, Stirling City or Forest Ranch, pick up your mail at the downtown Chico Post Office, 141 W. 5th St. Berry Creek mail can be picked up at the Oroville Post Office, 1735 Robinson St. Bring photo ID.